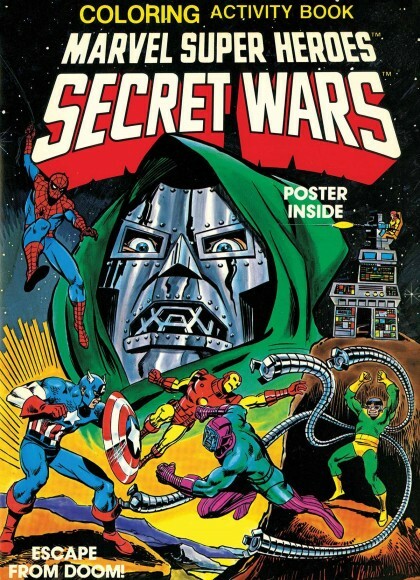 JUSTIN’S PICK :: MARVEL SUPER HEROES SECRET WARS ACTIVITY BOOK FACSIMILE COLLECTION: (phew) Like most fans of my generation, I am a victim of nostalgia. No industry exploits that propensity quite like comic books. 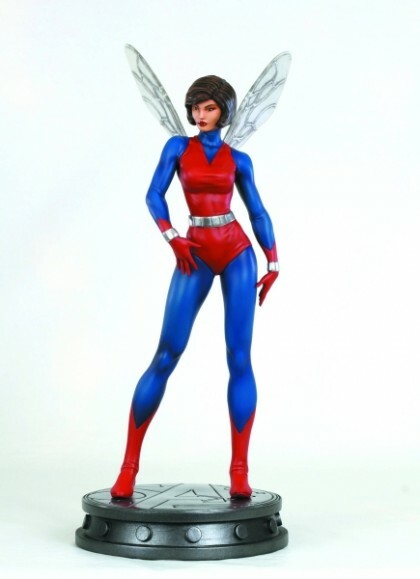 Alongside a cache of Silver Age treasures and unreliable TV reruns, Marvel/Mattel’s Secret Wars toy line was one of my earliest touchstones for the characters I grew to love. In anticipation of its Big Summer Event incarnation, Marvel is releasing this activity book facsimile collection. I don’t think I even had this as a kid, which makes owning it now even more imperative. ‘The specifics weren’t important,’ reads a particularly illuminating appendix in the trade paperback collection of the original Secret Wars series, ‘as long as it featured unique designs that could be made into toys, and as long as it was called “Secret Wars” – two words Mattel had found tested well with adolescent boys.’ Creepy as grown men dispassionately analyzing children may be, the marketing works: thirty years on, and I’m still buying this stuff. Score one for target demographics. 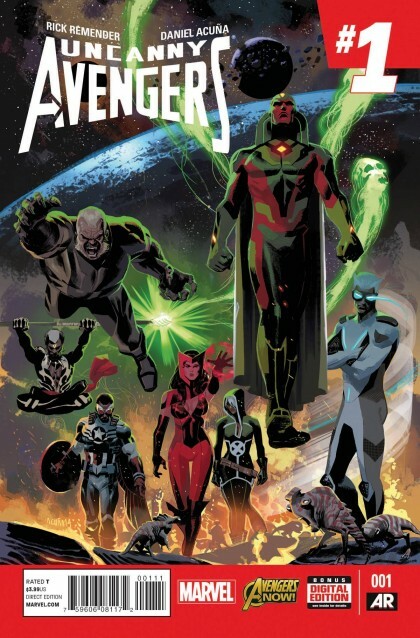 JUSTIN’S PICK :: UNCANNY AVENGERS #1: Another Marvel relaunch destined to inspire endless diatribes of Internet nerdsnark. Nevertheless, I’m excited to see a new iteration of the Avengers’ Unity Squad. Including a historical Avenger like the Vision on the roster only deepens this group’s significance, and throwing in a left field B-lister like Dr. (Brother) Voodoo is super cool (70s genre Marvel is kinda my jam). Also, Rick Remender and Daniel Acuña play well together, so let’s check the cynicism at the door and have a little fun, shall we? 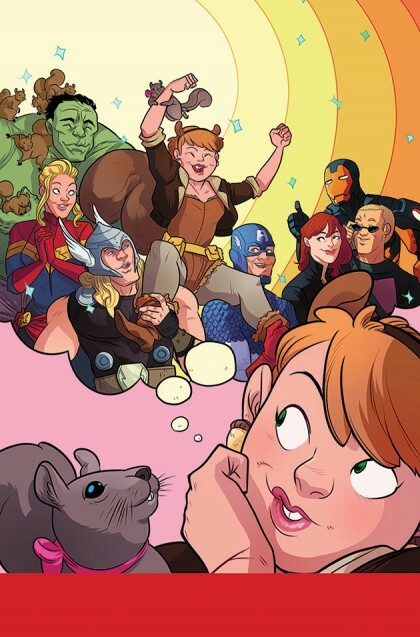 HEATHER’S PICK :: UNBEATABLE SQUIRREL GIRL #1: Confession time, I had never heard of Squirrel Girl until a Free Comic Book Day a few years ago when a local cosplayer, Amberle, showed up in a most amazing costume. A bigger confession, until someone told me that she was a Marvel character, I thought Amberle just really loved squirrels. This week I will be able to start learning all about Doreen Green and her best squirrel friend, Tippy Toe. Doreen is leaving her secret apartment in the attic of Avengers Mansion (I seriously love that little detail and all of the fun things that are stored up there) and heading off to college to study computer science. Written by Ryan North, adorably rendered by Erica Henderson, and colored by Heroes’ very own, Rico Renzi, this all ages tale is sure to thrill. 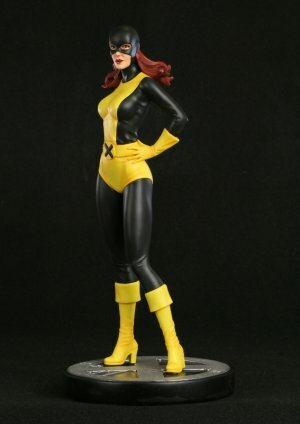 I for one can’t wait to have another female centric book from Marvel to read. Did I mention there’s an awesome Skottie Young variant cover and an Art Adams variant as well?!? Don’t be a nut and miss out on this great new book! 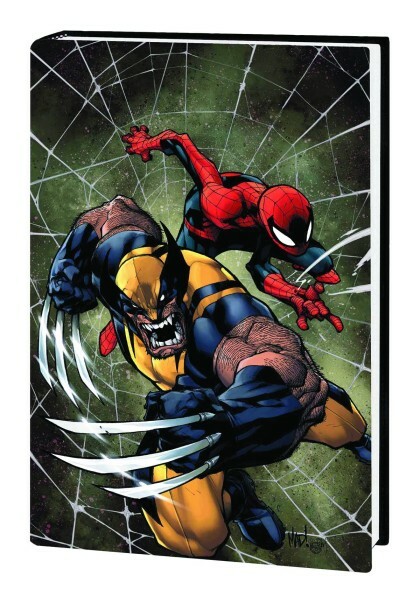 JUSTIN’S PICK :: SPIDER-MAN AND WOLVERINE BY WELLS AND MADUREIRA HC: I’m just gonna come out with it: in comics, Joe Madureira is to the 90s what Michael Golden was to the 80s; that is, Mad’s relatively modest body of work is comparatively massive in its influence. Traces of his kinetic, amped-up brand of storytelling are all over the stands today. With his stint on Uncanny X-Men, Mad conquered the comic book world. And while I am a bit disappointed he’s forgone proper inkers on his past few projects, the results have still been pretty great. This volume collects Mad’s yarns with scribe Zeb Wells, originally aired in the pages of Avenging Spider-Man (which I blabbed about here) and Savage Wolverine. A lot of these issues sold out at Heroes, and with a line-up consisting of Spidey, Wolvie, Red Hulk, Elektra, Mole Man, the Kingpin, and more, it’s not hard to see why. These stories are solid reminders of the joy and wonder that initially drew us – one and all – to comics. HEROESCON 2014 :: GUEST LIST UPDATE :: ESAD RIBIC & MORE! Happy New Comic Book Day friends! Have we got some Heroes Convention news for you?! 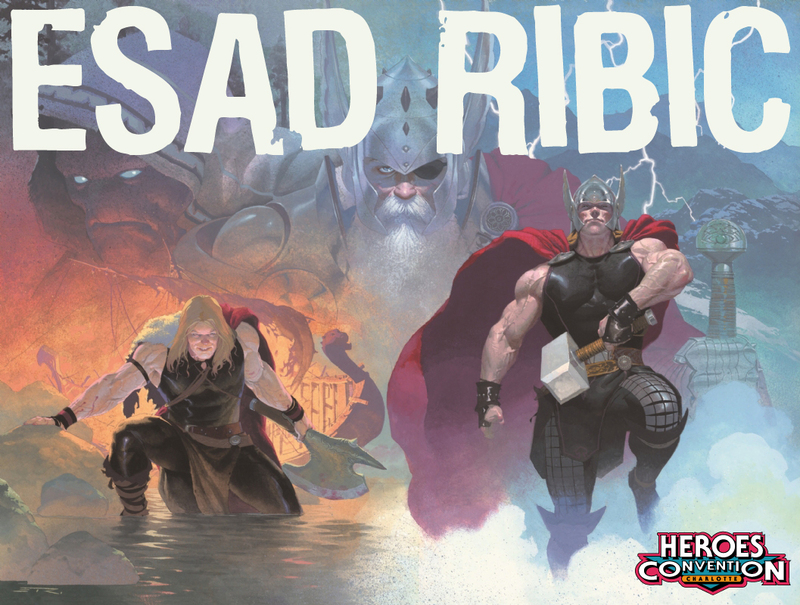 ESAD RIBIC, Croatian artist of Marvel’s Thor: God of Thunder and countless painted covers will be attending HeroesCon for the first time in 2014! Don’t miss your chance to meet this brilliant artist! Tickets for Heroes Convention 2014 are on sale now! That’s not all! We’ve added 5 more great creators to our guest list today! Heroes Convention takes place June 20-22, 2014. Click here for our full guest list so far. We are adding new guests all the time. Follow us on Facebook and Twitter for the latest Heroes news. Better yet, sign up for the Heroes Hotline and get all our news sent right to your inbox. Thanks! 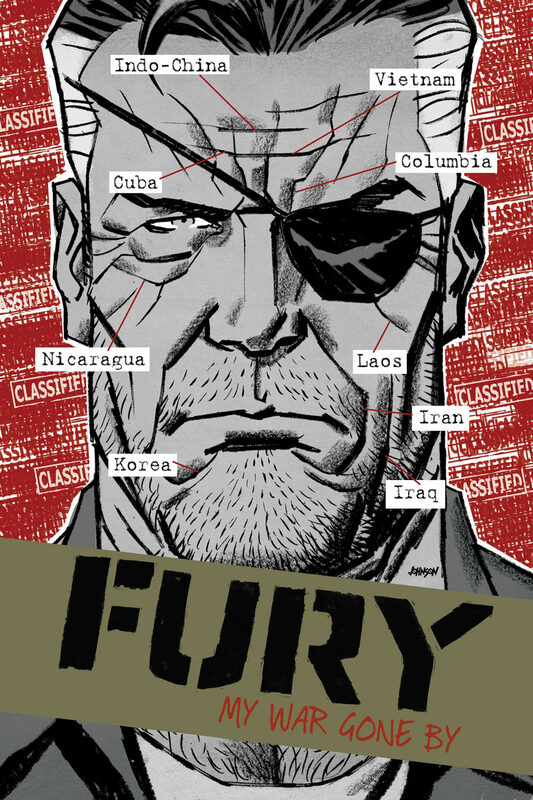 RICO’S PICK :: FURY: MY WAR GONE BY #13: Top to bottom this has been my favorite Marvel book since it started coming out in 2011. Every month we were greeted by another beautiful cover by Dave Johnson, a tough-as-nails story by Garth Ennis and flawless story telling by Goran Parlov and Lee Loughridge. 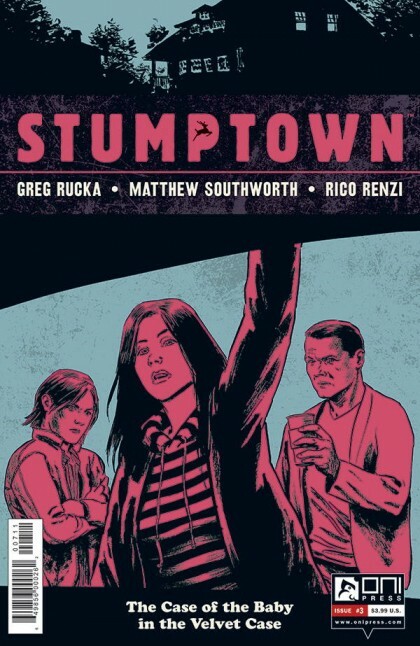 This issue is the series finale and I’m going to miss it! HEROESCON 2013 GUEST LIST UPDATE :: JIM STERANKO!! We’re thrilled to announce the legendary JIM STERANKO as a last minute guest for this weekend’s HeroesCon! From his inimitable work on Nick Fury, Agent of S.H.I.E.L.D. and Captain America, to his design work for Indiana Jones, Steranko is undoubtedly one of comics’ most influential creators. 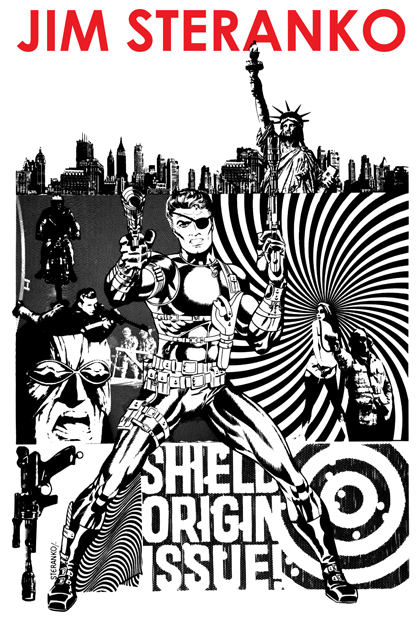 This marks Steranko’s first ever HeroesCon appearance, so it’s the first chance you’ll have to meet him, get an autograph, and hear him discuss his work at our show. Advanced ticket sales end tomorrow (Tuesday, June 4) at midnight, so take advantage of the little time remaining, and reserve your tickets now! 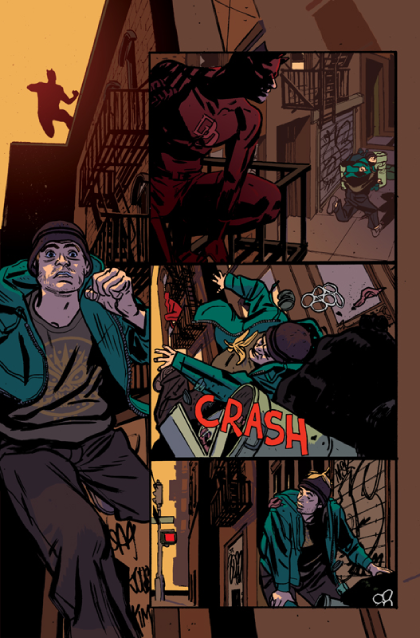 JUSTIN’S PICK :: DAREDEVIL #22 : Mark Waid continues his seminal run on Marvel’s Man Without Fear, ably abetted by the inimitable art of Chris Samnee. This issue finds ol’ Hornhead face-to-face with the Marvel U’s newest contender, the Superior Spider-Man. Matt Murdock is sure to sense something amiss with his old cohort, but the reappearance of a souped-up Stilt-Man might put those suspicions on the back burner. 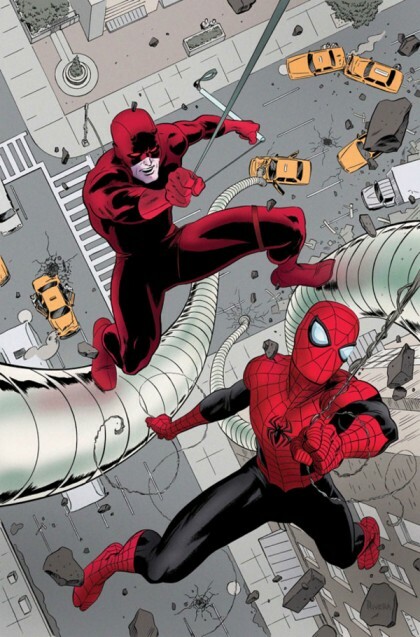 Tightly plotted and wonderfully drawn, Daredevil remains one of Marvel’s most premium offerings. Hurry– she moving pretty fast.